Sydney is the capital city of the Australian state of New South Wales and Australia's largest and oldest city, and the economic powerhouse of the nation. It has sun-drenched natural attractions, dizzy skyscrapers, delicious and daring restaurants and much more. Sydney has too heavenly beaches, a pleasant climate that sees over 300 sunny days a year, a stable local government. Australia has always been separated by at least 60 kilometres of water since the glacial maximum of 140,000 years ago - yet bushfires could have easily alerted those living north of the continent of its existence. The Sydney region, referred then by the local aborigines as Warrane, itself has been inhabited for at least 50,000 years. Although urbanisation has destroyed most evidence of these settlements (such as shell middens), there are still rock carvings in several locations. 1770: European interest arose with the sighting of Botany Bay (now a southern suburb of Sydney) by Captain James Cook. 1788: Under instruction from the British government, a convict settlement was founded by Arthur Phillip. Most convicts came from Ireland and England. A great number were in fact not real criminals but were simply sent to the new colony as a harsh punishment by the ruling aristocracy. Phillip first landed at Botany Bay, but found it unsatisfactorily shallow for a permanent settlement. After a brief sail north, Phillip founded the colony at Sydney Cove on Port Jackson (the correct name for Sydney Harbour). Phillip originally named the colony "New Albion", but for some uncertain reason the colony acquired the name "Sydney", after the British Home Secretary, Thomas Townshend, Lord Sydney. This is possibly due to the fact that Lord Sydney issued the charter authorising Phillip to establish a colony. 1822: Prisoners were quickly set to work to build the settlement and the town had banks, markets, well-established thoroughfares and an organised constabulary; by 1847, convicts accounted for only 3.2 per cent of the population. 1851: In this year was the first of several gold rushes, since which time the port of Sydney has seen many waves of people from around the world including an influx of people from Asia. 1901: Australia's states federated on 1 January, New South Wales became a state of Australia, and Sydney became NSW's capital. 1914: Australia went to war in support of Britain, and the economy boomed until the late 20s, when the Great Depression hit, in 1931 around a third of Sydney's workforce was unemployed. 1932: Wool prices rose, the city's building industry took off and Sydney once more became the most special city in Australia.The Harbour Bridge was also opened in this year. There was quite a kerfuffle at the opening of the bridge, when a sword-wielding chappie by the name of de Groot stole the limelight from NSW premier Jack Lang by slashing the opening ribbon before the premier could give it the official chop. During WWII,S ydney suffered little, although several Japanese midget subs were captured in the harbour. After the war, European immigrants flooded into the city, and Sydney spread rapidly westwards, gaining a bunch of pizza places in the process. 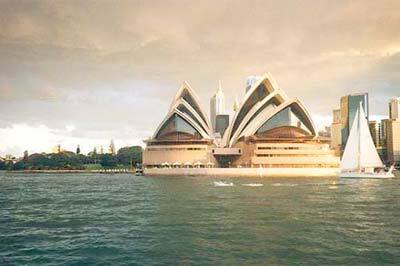 1957: It also picked up one of its most famous landmarks, in architect JØrn Utzon won a competition to design the Sydney Opera House. 1966: before the completion of the Opera House, Utzon resigned in frustration at compromises to his plan. Another architectural team took over, and the Opera House was opened in 1973. During the Vietnam war, Sydney became a major R&R stopover for US GIs, and the city started tasting of Coke and burgers, while King's Cross developed a fine line in sleazy entertainment for the visiting lads (a speciality it maintains to this day). 1970: New South Wales (NSW) went against the national trend and voted Labor, and longstanding premier Neville Wran oversaw much of Sydney's building boom. The Bicentennial celebrations in 1988 and the massive Darling Harbour redevelopment project boosted the city's morale, and today the economy is doing reasonably well, though unemployment remains high. 2000: After winning the bid to host the Olympic Games, Sydney poured vast amounts of money into renovating and prettying itself up. Sydney continues to expand with various new waves of European and later, Asian immigration, resulting in its highly cosmopolitan atmosphere of the present day.